Using the RGB color modelling technique, I can safely say that red and blue mixed together comes up looking like purple. Along similar lines, I can also say that by using the Marvel modelling technique, if I mix together Charles Soule, Ron Garney, and Matt Milla, I'll end up having the following comic book published in April, 2017. Lovely. TO QUOTE John C Maxwell: 'Self-centered leaders manipulate when they move people for personal benefit. Mature leaders motivate by moving people for mutual benefit'. At the end of last month's episode we all saw Matt Murdock opening his front door and being confronted by two purple children. Or to be more specific about it, 'The Purple Children', children sired by the big, bad, Purple one himself, Zebediah Killgrave. As many of us know, Killgrave has the ability to manipulate people and bend them to his will. The example we are presented with in this issue, issue 18, is in a scene where he escapes from prison by getting a woman to kill one of the guards who's supposed to be guarding him. Basically, the guard wants Killgrave to force this woman to fall in love with him, but what he does instead is force her to kill him so the Purple one can make his escape. Now, back to the story, and yes, two of the Purple Mans children have managed to track down Matt so he can help them with a problem they're having. From the looks of it, their father is once again kidnapping his children, his many-many children, in order for him to grow more powerful with his abilities. Yet luckily enough, these two children, Joe and Shallah, have somehow managed to evade his grasp. 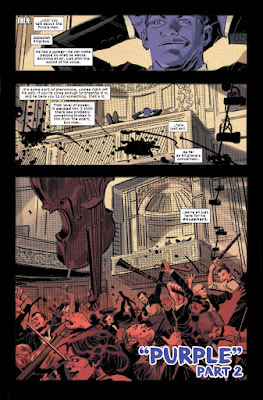 That is, until today, when an army of purple controlled people pursue them through the streets, right up to the front door of Daredevil himself, Matt Murdock. Quickly, Matt takes the children and his partner, Kirsten McDuffie, to one side, and orders them to lay low for a while in a purpose built panic room. While they do this, Matt suits up into his Daredevil outfit and attempts to stop these possessed people from doing themselves, or the children, any real harm. Matt knows all to well what a person can do when they're being controlled by external forces, so he feels kind of bad for having to hit them and stop them in their tracks. But he does, eventually he does stop them, which leads Matt and the children to then rush off and confront the man who's behind this. On the whole I thought that this was a pretty decent story to read. Charles Soule's tale had all the necessary ingredients needed for a great action-adventure, as it was comprised of a bit of back-story, a bit of action, a bit of character progression, all of which was housed within a flash-back sequence that will answer for us one simple question: How did Matt make the world forget he was really Daredevil? From the looks of it, so far it seems that Killgraves machine may have something to do with this. And if not that, then maybe his children, or however else this adventure ends! I could be wrong of course. But in the same breath, that's how things seem to be panning out. 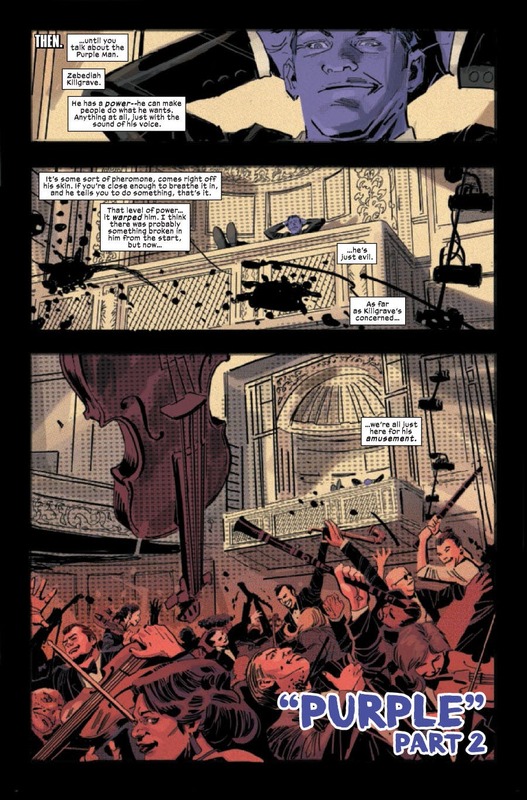 Something else about this issue I thoroughly enjoyed can be seen in the amazing artwork provided by Ron Garney. On occasion it looked like he was channelling Chris Samnee, who was the previous artist on this series, especially when it comes to his minimalist approach to designing and laying out the comic book page. I also liked the way he stamped his own mark upon this tale. 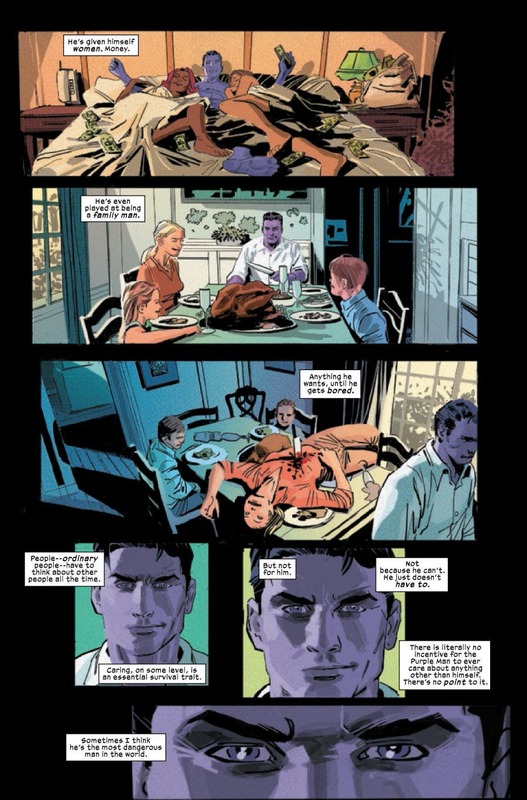 Just check out the pictures' provided and tell me that Ron's art doesn't scream out drawings that resemble the work of either Frank Miller or David Mazzucchelli!! That said, however, the one thing about this issue I wasn't to keen on was its sparse method of structuring a story. The overall premise plays out as follows: (1) The purple children turn up. (2) Matt explains to the priest about them and their father. 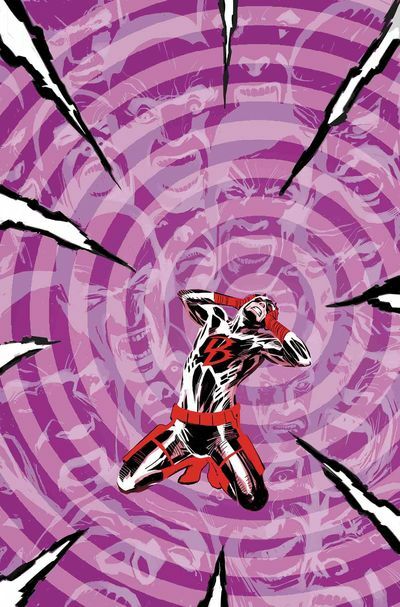 (3) Daredevil fights off the people who are attacking the purple children. And (4) The three of them rush off to fight Killgrave. The end. To be continued. Of course I do mean this with all due respect, because essentially, every sequential story-line is a stepping-stone story-line, with each step in a tale having to be laid out one issue at a time. It's just that in this case; the step is a lot more obvious because of its sparse nature, even though on the whole most of the tale was a pretty decent read. For obvious reason's, I'd like to musically match-up this episode with the Sheb Wooley song, the 'Purple People Eater'. I'd like to compare this month's adventure to an eggplant, which is also known as an aubergine throughout Europe. 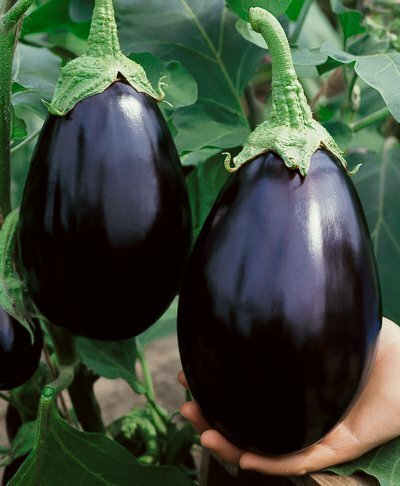 My reasons for doing this are pretty simple really, because, just like this book, an eggplant is purple on the outside, benign on the inside, yet does fairly well when it's integrated with other ingredients. You know it makes sense. Kind of. Sing a rude song about making love to a sheep. Dress up like a woman. Stop the Purple Man's children from attacking him. Sing a rude song about dressing up like a Mexican woman who stops children.